Gas flame comes on first few times then quits and igniter keeps cycling on and off but never lets the gas go. 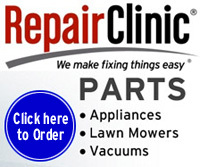 Replace the coils on the Gas Valve. No flame, no igniter glowing at all. 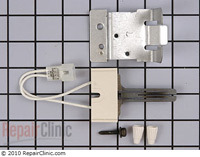 Inspect igniter for small burnt spot on dark gray or black part of igniter or check for 110 volts to igniter when dryer should be calling for heat. Dryer is running but will not heat, what could it be? 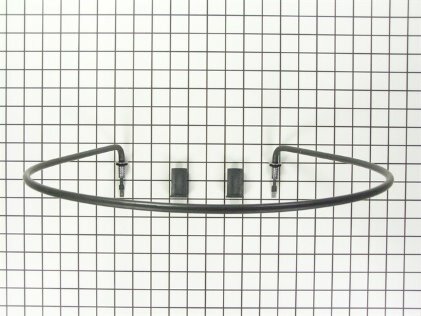 How do dryer thermostats work ? The parts that I have pointed out with the arrows are the parts that you will need to check with an ohm meter if the dryer is not heating. First check and see if you have 110 volts coming to the gas valve at this type of a connector. 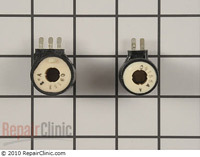 If you have voltage, then unplug the dryer and check the parts I have pointed to. Some dryers have 3 coils instead of the 2 shown here. 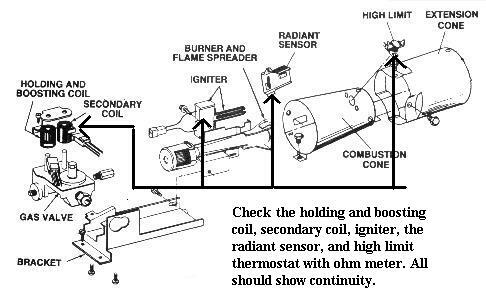 If you do not have voltage coming to the burner, then you will need to check the timer contacts that feed the gas burner, hi limit thermostat, operating thermostats, the safety switch on the motor, and any other point that you can see on your wiring diagram picture that feeds voltage to the burner. The coils on the gas valve are very bad for working once or twice and then quitting. 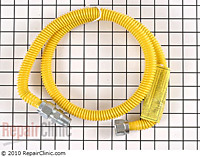 If you find a open circuit on one of the gas coils, replace them all = less problems later on. If the glow coil does not work ( get red ), check it with a ohm meter for continuity. The next thing to check if the glow coil does not come on would be the radiant sensor. 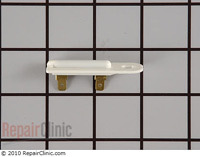 Inspect the igniter for small burnt spot on dark gray or black part of igniter or check for 110 volts to igniter wire plug when dryer should be calling for heat. 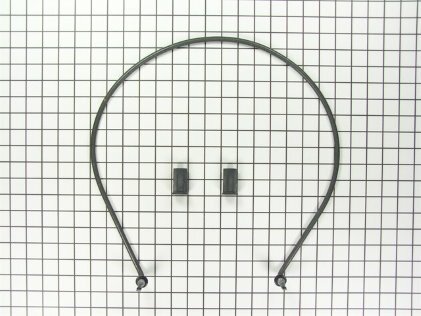 Sometimes the ( older style ) igniter is separate from the holder and the holder can no longer hold the igniter tight enough and the two parts burn/arc where they touch each other = new igniter and holder ( some manufactures have new kits to replace these older style parts ). Does the igniter get red and stay red, or does it get red, you hear a click and it goes off, then a minute later its gets red again?....if so you possibly have a bad set of coil valves. If the igniter gets red and stays red constantly then its the flame switch that is bad and maybe welded closed. If you are having trouble with a funny smell inside your dryer or on your clothes, consider this...have you painted or varnished anything inside the home recently? Your gas dryer uses a lot of air, not just the air that blows out the vent but the air used to burn the gas ( natural or propane ) as well, anything like paint fumes or varnish fumes in the air will be picked up in the air used by the burner flame and burnt....this is often described by customers as - burnt fabric softener smell ..... - burnt soap smell .... - burnt medicine smell. Open your windows, air out the basement/home as good as possible, most customers tell me this will go away after a week or so once everything is dried and all the fumes are gone. Remember, if you smell gas....turn off the gas valve to the dryer and call for service!! A tip from ( Assistant Chief Fire Marshal Douglas ) - This is sometimes caused by the filter not being completely clean. By this I am referring to the clogging of the screen from the use of fabric softener sheets. The chemicals in these sheets will, over a period of time, impair the air flow through the screen and cause the "gas odor" to become prominent – not to mention the temperature to rise within the dryer. I clean my filter with soapy water and a tooth brush about every other month and it keeps this from occurring. Some instructions and a good picture of a pilot latch assembly. 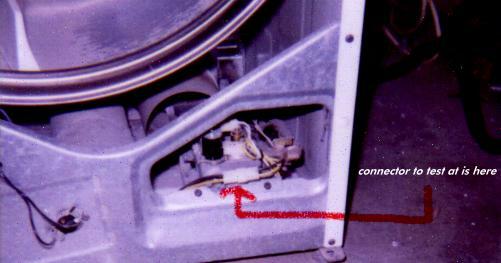 On the back of the dryer near the fan blower housing is a thermal fuse, if this opens up ( no continuity ) the gas burner often quits but the motor will still run. If the thermal fuse is open/bad, always clean, change, adjust the venting system and vent hood first and clean out the dryers air ducts. Sometimes it is a good idea to replace the operating thermostat at the same time. 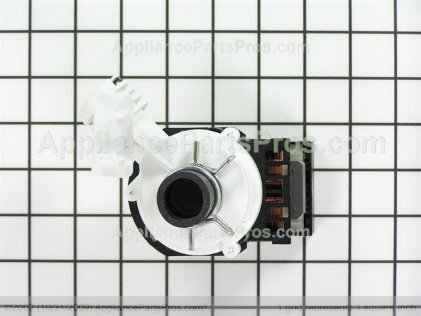 Thermal fuse parts help link...on blower housing cover, can not be re-set, must be replaced if is open (no continuity between pins). Stainless Steel Connector for Gas Range - Has everything you need to connect your range to your gas shutoff valve, including 4 feet of 5/8-inch outside diameter coated stainless steel gas connector with two fittings, leak detector solution and pipe sealant compound. Procoat polymer coating resists corrosion caused by bleach, ammonia and acids found in many home care products.